Children could play an important role in solutions to reduce marine litter with some already helping to educate parents and peers about the scale of the issue, according to a new study by Plymouth University. Research conducted at the 2013 Ecover Schools Blue Mile, staged in the city, sought to examine children's understanding about marine litter and the potential problems created within the marine environment. It also tested the impact of an educational activity designed to raise their awareness, change their attitudes and promote greater action to reduce waste, particularly plastic. The results, published in the Marine Pollution Bulletin, show the activities staged at the Blue Mile event not only changed youngsters' views on the impacts and solutions, but they also showed significantly greater concern after taking part in the event. Their knowledge improved regarding the possible sources of the rubbish, the predominance of plastic, and the potential time it takes litter to degrade while the children also reported that since the event, they encouraged family and friends to perform more litter-reducing behaviours. Dr Bonny Hartley, Research Fellow in Plymouth University's School of Psychology, led the research. She said: "Children are important agents of social change in society and represent the future citizens and consumers who will develop attitudes and make decisions that will inevitably affect the environment. This study represents the first assessment of children's attitudes and behaviours towards marine litter, and the results demonstrate the importance of conveying information about simple actions everyone can take that will help reduce it and the potential 'pester power' children may have in encouraging change. Indeed, school children may play a major role in educating their parents, who were brought up in a 'throwaway' generation." 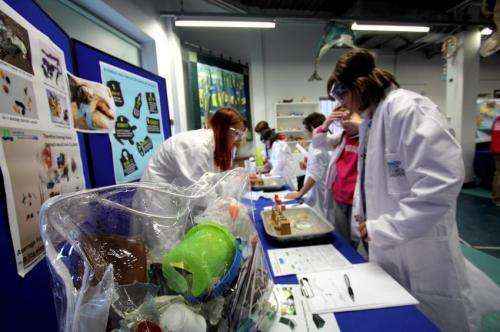 For the study, 176 children aged eight to 13 and from nine schools in South West England took part in an educational event at the National Marine Aquarium. They completed a short questionnaire before and after participating to evaluate whether their attitudes and reported behaviours had changed as a consequence of learning, and how they could be part of the solution in the future. In one activity, children were presented with a mock shop to see if they could make an informed decision on what they were buying, with products following a traffic-light labelling system to represent the environmental and waste footprint of the product. They were then given a shopping list with the task to 'purchase' products using tokens and at the 'till' they received the 'eco-price' of their shop and were then required to alter their product choices to decrease the packaging footprint. Professor Richard Thompson, from the University's School of Marine Science and Engineering and a world-renowned expert on marine litter and microplastics, said: "Marine litter is a global environmental problem. Finding potential solutions is challenging but it is now clear that a major step forward is working to capture waste before it enters the ocean. This can only be achieved by collective action from consumers, industry and policy makers. At the heart of it is changing the way we do things and working with youngsters to help us move toward a better environment for the future is fundamental for success." Perhaps one of the students will find a way to capture much of the plastic litter in the oceans, and use it for fuel to get the rest.